Envoy Air Inc. is building upon its existing pilot pipeline programs with the expansion of an industry-leading "instructor" cadet program with CAE. The Envoy Cadet Program assists the most promising future pilots in making a smooth transition from the classroom to the cockpit. Combined with Envoy's seniority-based flow through to American Airlines, the cadet program provides unmatched advancement opportunities. As an official Envoy cadet partner, CAE will hire Envoy cadets as Certified Flight Instructors to provide training at CAE's academy in Phoenix, Arizona. As part of the program, cadets will benefit from gaining experience in a professional environment while building the 1,500 required flying hours to advance their career. 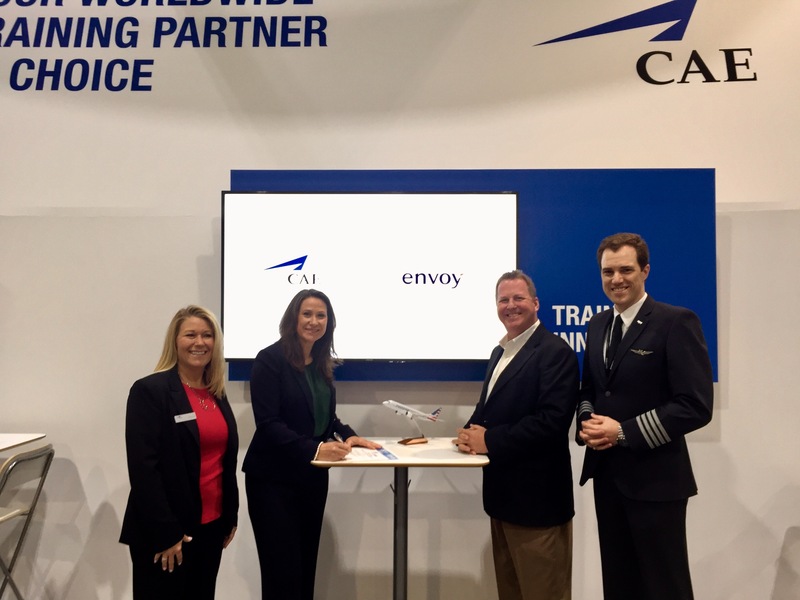 "We're delighted to formally welcome CAE to Envoy's Cadet Program," said Ric Wilson, Envoy's Vice President Flight Operations. "As CAE is one of the leading and most respected training organizations in the world, cadets will join the existing CAE team that delivers the highest quality training." "We are proud to partner with Envoy to support its need for pilots in North America," said Nick Leontidis, CAE Group President, Civil Aviation Training Solutions. "Flight instructors play a critical role in our ability to provide high-quality and safe training to the pilots of tomorrow. As the leading training organization in the world, we are delighted to offer these cadets with the possibility to advance their professional pilot career and allow them the opportunity to influence the creation of future pilots." The Envoy Cadet Program offers various levels of support as the cadet's certifications, training and experience evolve, including $5,000 in financial assistance. Mentorships and internships with airline industry experts can begin as early as a cadet's freshman year. As cadets achieve more certifications, they become eligible for financial assistance. Placement at partner schools to serve as instructors is an opportunity for cadets to build their flight time, at no cost. "The Envoy Cadet Program allows us to ease the financial burden faced by aspiring pilots wanting to pursue this career, while simultaneously giving Envoy access to some of the nation's top aviation talent," added Ric Wilson. "Nearly 110 pilots have already come through our existing Pipeline programs and are now flying as First Officers for Envoy, with 87 currently employed by Envoy as instructors or completing their qualifications. We expect the enhancements in the cadet program to attract even more pilots to join our team." New hire pilots are projected to upgrade to Envoy Captain in just two and a half years and flow through to American in just under six years, with no additional interview required. Nearly 60 percent of American's new hires since 2013 came from Envoy. With crew bases co-located in American's largest hubs of Dallas/Fort Worth, Chicago, New York and Miami Envoy pilots enjoy ease of commuting and worldwide travel. For more information on the cadet program and application requirements visit envoyair.com/cadet. Or contact Envoy Pilot Recruitment at 972-374-5607 or e[email protected]. Envoy Air Inc. operates about 180 aircraft on more than 800 daily flights to more than 150 destinations throughout the United States, Canada and Mexico. The company's more than 14,000 employees provide regional flight service to American Airlines under the American Eagle brand and ground handling services for many American Airlines Group flights. The company was founded in 1998, as American Eagle Airlines, Inc., following the merger of several smaller regional carriers to create one of the largest regional airlines in the world. Envoy is headquartered in Irving, Texas, with hubs in Dallas/Fort Worth, Chicago, New York, Miami and large ground handling operations in Los Angeles, Miami and New York. American Airlines and American Eagle offer an average of nearly 6,700 flights per day to nearly 350 destinations in more than 50 countries. American has hubs in Charlotte, Chicago, Dallas/Fort Worth, Los Angeles, Miami, New York, Philadelphia, Phoenix, and Washington, D.C. American is a founding member of the oneworld alliance, whose members and members-elect serve nearly 1,000 destinations with 14,250 daily flights to 150 countries. Shares of American Airlines Group Inc. trade on Nasdaq under the ticker symbol AAL. In 2015, its stock joined the S&P 500 index. Connect with American on Twitter @AmericanAir and at Facebook.com/AmericanAirlines.